How Predictable Are Nobel Prizes in Economics? I was going through a pile of old papers in my office when I found a sheet entitled “Blackboard at the University of Chicago October 5, 2005: Future Nobel Laureates.” I have no idea who brainstormed the list that was written up on the board, or why. I can’t even remember whether I took part in the exercise, although seeing how good the predictions have turned out, I’m going to assert (rightly or wrongly) that I was one of the predictors. So how have the prognosticators done? Pretty darn good. The list contains 41 names, at least seven of whom are too young at this point to reasonably be under consideration. So that leaves 34 names that possibly could have won the prize to date. 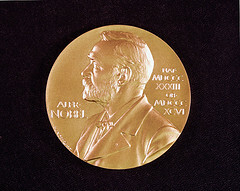 Since 2005, seven of the twelve Nobel Prize winners were drawn from this list: Edmund Phelps, Roger Myerson, Paul Krugman, Oliver Williamson, Peter Diamond, Dale Mortensen, and Christopher Pissarides. At least a couple of the prize winners would have been very difficult to predict in advance (e.g. Elinor Ostrom, whom I literally had never heard of when she won the Nobel). There is no question that this list has performed far better than any list I would have produced at the time. If the list-makers wrote up their picks, starting with those they thought most likely to win at the top, they didn’t do a very good job in that dimension. While the very first name on the list was a winner, the bottom of the list has been the best place to be, with three of the last six names garnering a prize. By that criterion, put your future Nobel bets on Jean Tirole, Doug Bernheim, and Claudia Goldin (the only woman on the list). The only woman to ever win the Nobel Prize in Economics, for those who are only casual observers of the field. And only one woman on the Future Laureates list. It seems to me, the first study a new economist should do is research what/if any are the most common attributes to winning a Nobel prize. My vote would be for Thaler. His work on the NFL draft was interesting and applicable. Call me a selfish sports fan, but that paper was awesome! I think it is a scandal that Tirole hasn't won it yet. The Nobel Memorial Prize for Economic Sciences is not a "Nobel Prize" and should not be referred to as such. The Nobel Prizes are the prizes created in Alfred Nobel's will (chemistry, physics, physiology/medicine, literature, peace). The photo is the obverse of a Nobel Prize medal. The obverse of the medal for the Nobel Memorial Prize for Economic Sciences has a different image of Alfred Nobel. I think that more interesting is that someone who is really at the cutting edge of their field, doing groundbreaking work, can remain completely unheard of in that same field. Shiller should win for his work on market volatility.